State budget decision may set back childhood obesity prevention efforts. Childhood obesity is again in the news today. The San Francisco Chronicle is running a story about Fresh Start, a program that provides fresh fruit to school children for breakfast and snacks. According to the story, the California Legislature cut the $11.1 million proposed by Gov. Schwarzenegger for Fresh Start in order to cover a $366 million funding gap in the education part of the state budget. The pending decision comes on the heels of preliminary evaulations of the program by UC Berkeley's Center for Weight and Health, which found that fresh fruit offerings tripled at participating schools during Fresh Start's first year. The article, written by Carol Ness, said state superintendent of schools Jack O'Connell called on legislators to restore Fresh Start during conference hearings at the end of June. Ness also quoted a spokesman for the governor as saying the program "is something we are going to continue to fight for." UC Cooperative Extension is working to engage parents in the fight against childhood obesity. In a number of California counties, UCCE academics are part of local coalitions aimed at pooling community resources to turn around an epidemic of over eating and lack of exercise. The Napa Valley Register today profiled a 13-year-old boy, a "picky eater" who subsisted on fast food and sugary snacks. With the advice of a local dietician -- a member of the Napa County's Children and Weight Coalition -- the family is beginning to change the boy's unhealthful habits. Now, the family's refrigerator is filled with plenty of fruit, according to Register reporter Christina de León-Menjivar. “If he’s hungry, I tell him, ‘Eat an orange,’” the boy's mom is quoted as saying. The story announces the fact that the Children and Weight Coalition of Napa County holds a meeting tomorrow to discuss childhood weight and health issues in Napa County. The meeting will be in the UC Cooperative Extension Office in Napa. 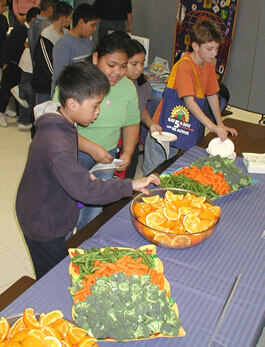 Children at a UCCE event enjoying fresh fruit and vegetables. The UC Riverside issued a press release yesterday announcing that biology professor Leonard Nunney received a $1.75 million grant from the USDA to study the Xyella plant pathogen, which is causing serious diseases in a wide range of agricultural and horticultural crops. According to the release, there are three main Xylella subspecies found in North America: fastidiosa, which causes Pierces disease in grapes and almonds, sandyi on oleanders, day lilies, magnolias and jacarandas, and multiplex on almonds, brittlebushes, sages, olives, oaks, plums and peaches. 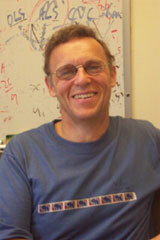 "There are several puzzles about this bacterium," Nunny was quoted in the news release. "If you find Xylella on a certain plant, you can't predict what else it might be found on. . . . We need to understand what it is about these plants that makes each type of Xylella favor them." This grant and Nunnery's work is sure to generate interest in the the ag media as well as general news outlets. Environmentalists and farmers work together to protect bird. 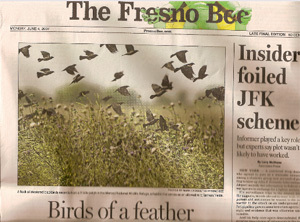 The Fresno Bee today featured a 40-inch story in the front page section about the tricolored blackbird. (I realize this blog disproportionately refers to Fresno Bee stories. The paper is, after all, reporting from the No. 1 ag county in the world.) The article doesn't quote ANR scientists, but because it is so closely tied to the agricultural industry, an important ANR clientele, I believe it belongs in the ANR news blog. Bee reporter Mark Grossi interviewed UC Davis staff research associate Robert Meese of the Department of Environmental Science and Policy. He reported that the tricolored blackbird is not an "endangered species," and farmers want to keep it that way. Already, they have to deal with flocks of thousands of birds. Grossi opened his article with the story of a Kern County hybrid wheat and rice farm. "To the chagrin of the farmer, the 75-acre field became an avian mega-nursery." The farmer sold the crop to the government to avert a wildlife disaster. "You can understand why the birds might be considered a pest by dairy owners," Meese was quoted in the article. Though a nuisance, farmers do not want to see the bird's population dip low enough to trigger Endangered Species Act protections. "Farmers and environmentalists -- often adversaries over wildlife issues -- have joined in an unusual alliance with government wildlife agencies and scientists to work on the blackbird problem," Grossi wrote in the article. Video marks step toward future of ANR news. I've blogged about the past and present of ANR news. Today, I have the privilege of blogging about the future. In the age of YouTube, this will not seem to be a big step, especially to under-40-year-olds. But to those of us whose childhood was recorded on 8mm film and viewed only twice when a clacking projector was dragged out of the closet, it is significant. Today, the first ANR news video was posted on our Web site. The story was conducive to visuals. Live sheep graze in a research vineyard surrounded by beautiful scenery. At one point, two Canada geese soar across the background as UC Cooperative Extension farm advisor Morgan Doran answers questions about his research. Right now, the three-minute video launches as soon as you go to the site. UC ANR's video professionals in Communications Services are working on refining the video output. Soon there will be on-screen controls and other refinements. We plan to continue providing the media with a closer look at UC research and extension programs though the use of this technology and others developed in the future. 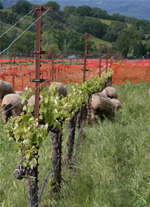 Sheep in a research vineyard at Hopland REC.